According to APC's scribe, the supplementary elections scheduled in the above-mentioned states must be allowed to be free and fair and void of alleged rigging by the PDP and allegedly supported by INEC against the will of the electorates whom, according to Issa-Onilu, have already decided to give their mandates to the APC. The APC however urged that "We equally urge INEC and relevant security agencies to ensure the supplementary election is free, peaceful and fair compared to the last inconclusive governorship election in the state which was characterised by many irregularities and voter intimidation. No political ambition is worth the life of any voters. "In conclusion, as a party, the APC is very confident of victory in the forthcoming supplementary elections. Our commitment to free and fair elections in the county remains resolute. We urge INEC to ensure that all loopholes that led to rigging, vote buying and intimidation of voters by the PDP is blocked." 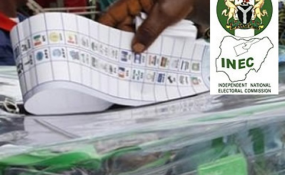 "After the March 9 governorship elections across the country, the polls in six states - Adamawa, Bauchi, Benue, Kano, Plateau and Sokoto - were declared inconclusive by the Independent National Electoral Commission (INEC). The electoral process was also suspended in Rivers state in a very fraudulent circumstance. In conclusion, as a party, the APC is very confident of victory in the forthcoming supplementary elections. Our commitment to free and fair elections in the county remains resolute. We urge INEC to ensure that all loopholes that led to rigging, vote buying and intimidation of voters by the PDP is blocked."